Paying off debt is a disaster, let’s just be honest. While starting out your life no one needs to be riddled with the stress that debt adds. Often though, student loans and credit cards are the only way we can survive the college phase. If you’re like my husband and I, you may have left college with quite a lot of debt. If you’re like us, you may have started out your first year of marriage with a combined debt of $100k. Where do you even begin to pay this off? I’m going to tell you how my husband and I did just that. It is possible and you can come out of it financially stable and successful…..but it’s hard. 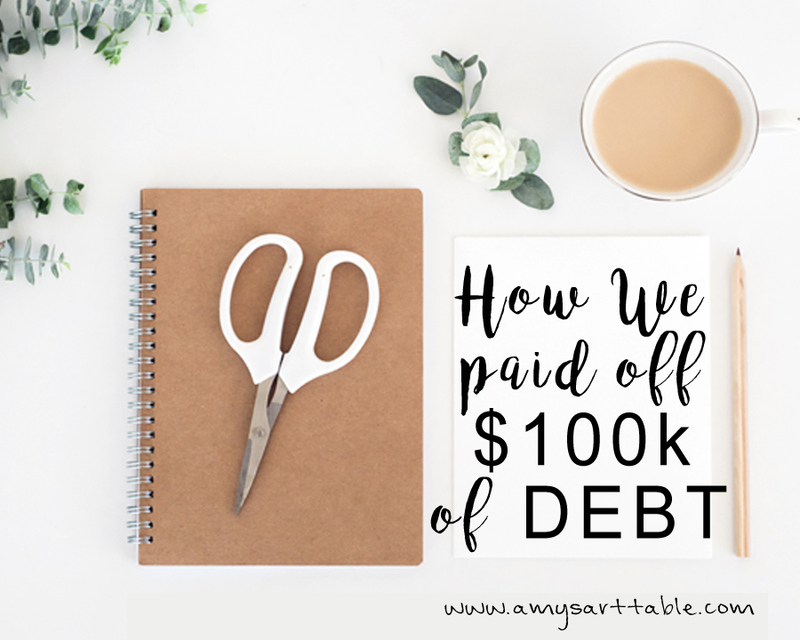 I want to share with you, not only how we did this but what I believe the true secret to paying off debt is so grab a seat and a cup of coffee because I am about to tell you some harsh realities. To begin the journey of becoming debt free you must first sit down and take a long hard look around. Our secret to paying off debt is: Honesty. You have to be honest with yourself. Truly Honest. And yes, it’s going to look painful. you can’t afford the things you’re accustomed to. Ouch. I said it and it’s the truth. Let it sink in for a minute. The sooner you accept where you are, the sooner you can become who you want to be. And here is the good news; you can afford many of the things that you want and feel you need when you are on the other side of that debt. Sacrificing your lifestyle for the shorterm can help tremendously in the long run. If you’re serious about getting rid of your debt once and for all, and you’re being honest with yourself, the next step is simple. Change your lifestyle. The only key factor that can actually make a difference in the journey to debt free. Be humble. And realize yes, it’s going to hurt for awhile. But… you’re going to get past this hurdle and when you do and this phase of life is behind you, you will have gained something that you don’t currently have. Options. Options, of how to use your money for your present and your future. Now that we’re being truly honest with ourselves. Let’s take a look at what changing a lifestyle really means. Now, let’s quickly discuss a common argument against this brutally honest strategy. What about life changing events, like my sister’s wedding in Texas, my grandmother’s 93rd birthday? etc. In these instances, my advice and how we handled these situations, was on a case by case basis. If we had the money at the time, we would fund said event if possible and do our best to stay on an extremely strict budget. I understand that things come up, life is out of our control and we have to roll with some financial setbacks at times, but we don’t need cable tv, dinner out and new clothes each week. Remember, how fast you erase your debt is directly related to your input of effort. If you want to get this crappy stage of life behind you, then give it your best, honest, effort. If you follow this secret, you will be amazed at how much you can let go of and in turn how much extra money you have to pay off debt. More on how to create a budget and stick to it in an upcoming post. Once you admit to yourself that you aren’t where you wish you were financially, you can finally start to really attack your debt and move forward with your life. This is what happened to us. Accepting where we were in our life allowed my husband and I to become a team committed to ridding our debt once and for all. Putting a stop to all unnecessary spending was a challenge and hard emotionally. I remember one time we told our entire extended family we wouldn’t be buying Christmas gifts, we also missed my parents anniversary dinner because of all the expense of gas and a fancy restaurant. But it also helped me to utilize and strengthen my skills. I learned to cook constantly to save money. In turn, we learned healthy eating. I sewed our old clothes when they were ripped. We made our old, paid off, cars last for 15 years. I clipped coupons and learned how to shop better. We made it work. We survived and truly understand the value of a dollar now. $100k of them. I truly truly think we are much stronger and more resilient from having worked through this process. I also now feel capable of teaching my kids about money. It took us eight years to pay off all of our debt and we are now currently without debt. Some of our student loans were slated to take 15 years to pay off and some 10. We got done early. We also were blessed with three children in this time period. Every situation is unique and every family is unique but you must first be honest with yourself and stop spending in a free for all way so that your extra money can be utilized. -stay positive, ask yourself (before each purchase), is this a want or a need? It is possible to climb out of massive debt, staying positive and being honest with yourself are the hardest parts of this journey. If you find yourself in this situation feel free to contact me or leave a comment.